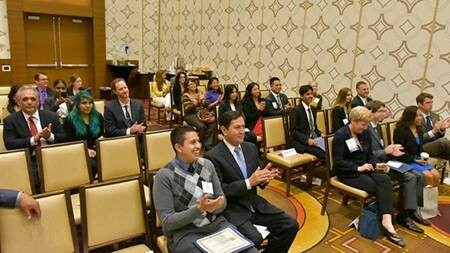 May 3, 2016 marked the beginning of the 90th Annual Word Trade Week in Los Angeles, and members of the UCLA Extension community were at the kickoff breakfast at the JW Marriott hotel in downtown Los Angeles to help celebrate the occasion. We were proud to sponsor the event once again, helping to provide a scholarship to a high school student interested in pursuing a career in international trade. 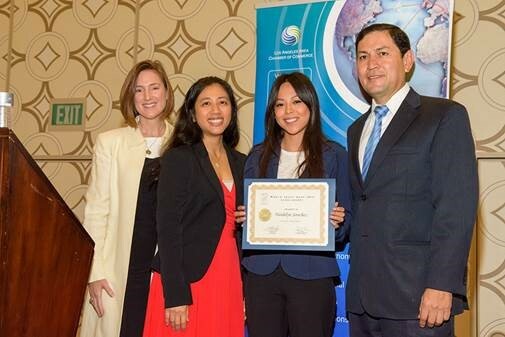 This year the scholarship that UCLA Extension helped sponsor went to Naidelyn Sanchez, a student at King Drew Magnet High School planning for a career in international law. Two UCLA Extension International Trade & Commerce certificate students joined our staff at the breakfast and had the opportunity to hear keynote speaker Alan Horn, Chairman of The Walt Disney Studios. David Ono, news anchor with ABC7 was the emcee of the event, and Los Angeles Mayor Eric Garcetti was also present as a special guest.